A Wall Display For $25 Or Less! Whenever I'm thrifting-sniffing-around one thing I always make a point to look for is old frames WITH matting included - if you find a framed photo that's matted, PARTICULARLY CUSTOM matted - blind your eyes away from whatever shade and texture of ugly the frame is - and how terrible the photo is. Matting is really the element that catapults your framing into a higher level of sophistication - and unless you are crafty enough to buy and cut your own mats, or are fine with purchasing the selection of pre-cut run-of-the-mill-sized mats - it's pretttttty pricey to have professionally and CUSTOM done. 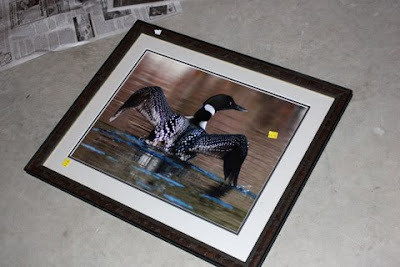 So here we are -- I found a very LARGE CUSTOM matted and framed (puke brown) photo (a duck....from the 80s.....an 80's duck). It cost me $4.50. Throw in a couple of knick-knack wall-hangings I got over a year ago and quickly fell into hating.....and a cheap gold-framed mirror - ALSO being sold for peanuts.